Saebo Mirror Box is a scientifically proven treatment tool used to speed up and improve motor function following stroke and other neurological disorders. During Mirror Therapy, the user places their affected limb inside the Saebo Mirror Box and the unaffected hand and forearm in front of the mirror. While looking at the image in the mirror, the client is then directed to perform movement with the unaffected hand in front of the mirror while simultaneously attempting to copy the movement with the hidden affected hand. 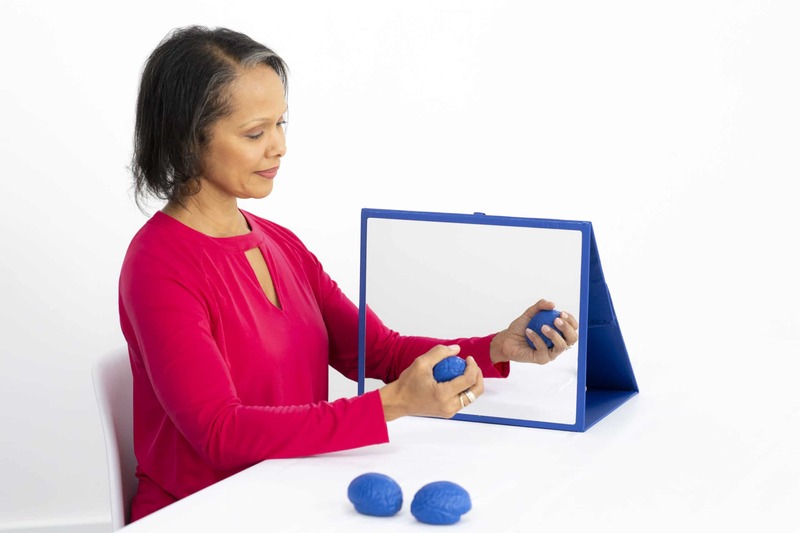 Saebo Mirror Box is a scientifically proven treatment tool used to speed up and improve motor function following stroke and other neurological disorders. During Mirror Therapy, the user places their affected limb inside the mirror box and their unaffected hand and forearm in front of the mirror. While looking at the image in the mirror, the client is then directed to perform movement with their unaffected hand in front of the mirror while simultaneously attempting to copy the movement with their hidden affected hand. Mirror Therapy helps program the brain to perceive the affected limb as the healthy one. This creates the illusion that both limbs are working normally. For example, if you put your left hand behind a mirror and right hand in front, you can trick your brain into believing that the reflection of your right hand in the mirror is your left. You are now exercising your left hand in the brain. It is believed that this strong visual cue from the mirror can therapeutically be used to improve motor performance and the perception of the affected limb. 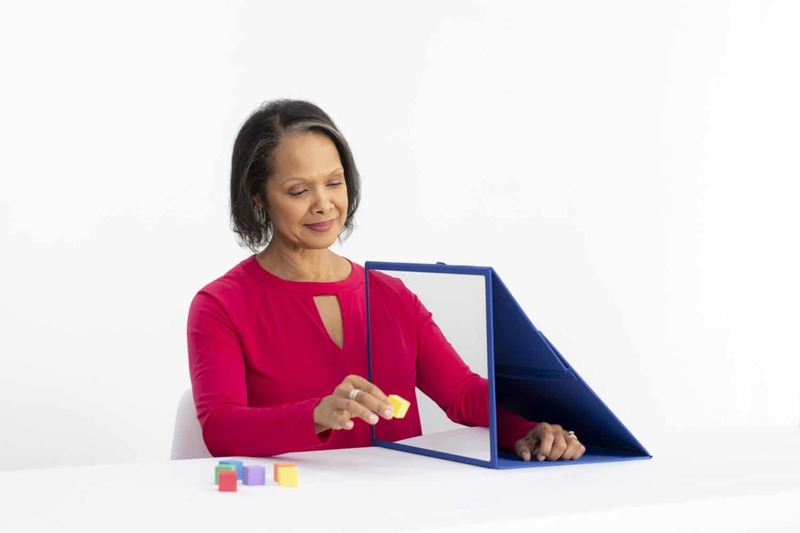 Saebo Mirror Box is a scientifically proven treatment tool used to speed up and improve motor function following stroke and other neurological disorders. During Mirror Therapy, the user places their affected limb inside the mirror box and their unaffected hand and forearm in front of the mirror. While looking at the image in the mirror, the client is then directed to perform movement with their unaffected hand in front of the mirror while simultaneously attempting to copy the movement with their hidden affected hand. Mirror Therapy helps program the brain to perceive the affected limb as the healthy one creating the illusion that both limbs are working normally. Clients suffering from neurological injury such as brain injury or stroke can benefit from mirror therapy. In addition, individuals afflicted by pain are also appropriate for this treatment. What Does the Research Say About Mirror Therapy? The scientific community is overwhelmingly in agreement about the effects of Mirror Therapy and stroke upper limb recovery. According to research, there is strong evidence that mirror therapy can improve arm and hand motor function following stroke. Studies show that Mirror Box Therapy can help with reorganizing the damaged part of the brain, also known as neuroplasticity, as well as improving motor recovery and function. What is the Clinical Criteria Required to Perform Mirror Box Therapy? Sufficient cognitive and verbal abilities to focus at least 10 minutes on the mirror reflection and follow instructions. With visuospatial neglect, clients should be able to turn their head towards the mirror image when asked to do so and keep their attention focused on the mirror image at least for 5-10 minutes. Sufficient balance and trunk control to sit in a wheelchair or normal chair unsupported for the duration of the treatment. Normal and pain-free range of motion. Severe constraints of the non-affected limb could limit execution of mirror therapy activities. Is a Licensed Therapist Required to Conduct Mirror Box Therapy? Mirror Box Therapy can be provided at home without the supervision of an occupational or physical therapist. Is a Prescription from a Physician Required? 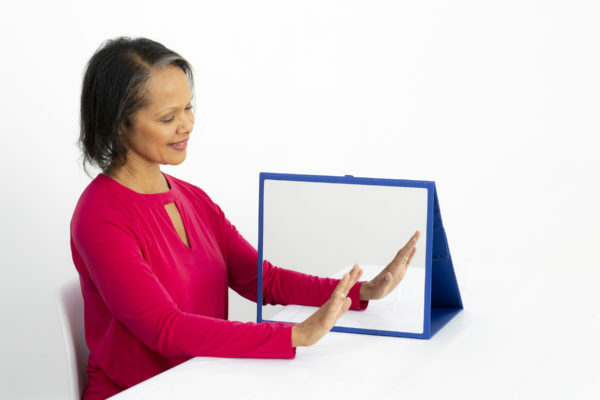 Research suggests that individuals suffering from stroke and other neurological injuries appear to receive the most benefit when Mirror Box Therapy exercises are performed at least 5 days per week for 30 minutes per day. What Are the Recommended Mirror Therapy Exercises? 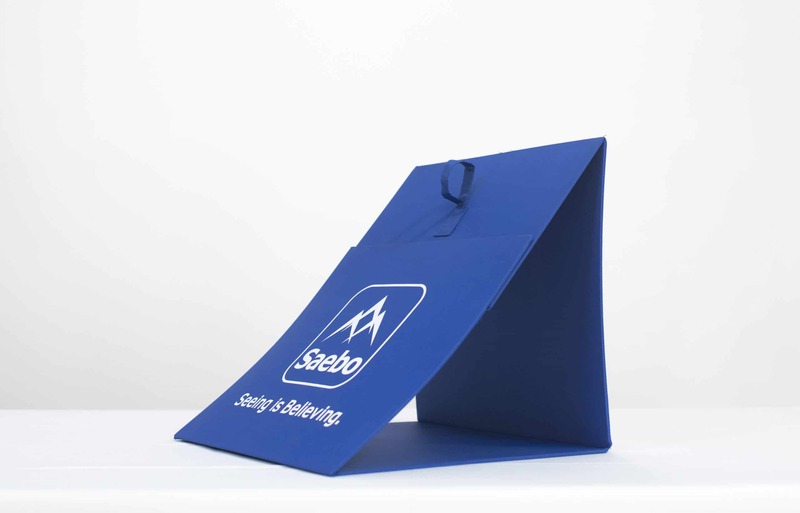 In addition to searching online for free hand exercises using the Mirror Box, ten (10) common hand exercises are included for free with each Saebo Mirror Box Therapy order. Is it Helpful to Combine other Modalities While Performing Mirror Box Therapy? Yes. To maximize the benefits of the treatment, combining Mirror Therapy with electrical muscle stimulation should be considered. In addition, research supports the combination of Mirror Therapy and sensory stimulation such as SaeboStim Micro.